KUALA LUMPUR: The Royal Malaysia Police (PDRM) seized 72 bags of jewellery, various currencies and valuables at luxury condominiums in Jalan Raja Chulan here this morning, believed to be linked to the 1Malaysia Development Berhad (1MDB) involving former prime minister Datuk Seri Najib Tun Razak. Bukit Aman Commercial Crime Investigation Department (CCID) director Datuk Seri Amar Singh Ishar Singh said another 284 boxes containing various luxury branded bags were also seized. He said the value of the seized goods could not be ascertained as yet as the seizures were massive, adding the police would make a detailed inspection later today to determine the value. “The CCID has inspected six premises related to the 1MDB investigations, namely the Prime Minister’s Office, official residence and four other homes,” he told a press conference after checking the condominiums here early today. Amar Singh said among the seized handbags were Hermes and Louis Vuitton brands. He said the condominiums were among the six locations inspected in connection with the 1MDB case. “For the raid at the posh residences, the police had obtained the necessary search warrant. The search was completed within two-and-a-half hours,” added Amar Singh. 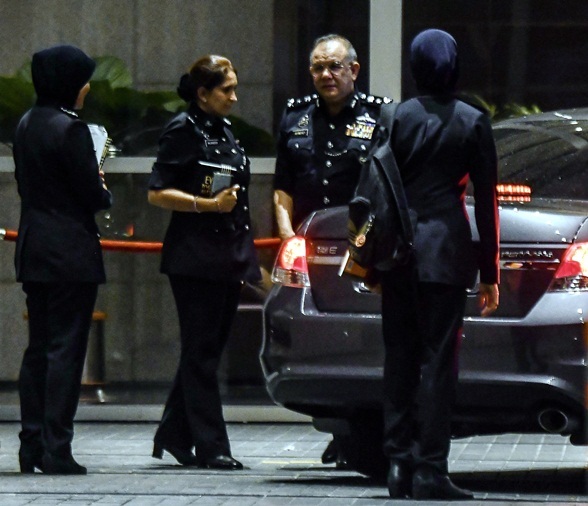 On the raids at the five other locations, he said among the goods seized were documents which were believed to be linked to the 1MDB and the raids would go on till the completion of the investigations. On the ownership of the three posh condominium units in Jalan Raja Chulan here, Amar Singh said the owner had a ‘Tan Sri’ honorific title. On media reports that claimed the seized goods included gold bars, Amar Singh declined comment. Asked whether the goods were sufficient evidence to prosecute Najib, he said the decision was up to Inspector-General of Police Tan Sri Mohamad Fuzi Harun. Amar Singh also explained that the iron safe found in Najib’s residence at Jalan Langgak Duta, Taman Duta here was still in the process of being drilled to be opened. “We have investigated this case with professionalism… I have also instructed all my personnel to conduct a detailed and thorough investigation,” he said. Amar Singh also said some of the seizures were made at Najib’s private residence in Taman Duta and gave an assurance to disclose all the seized items at the next press conference.